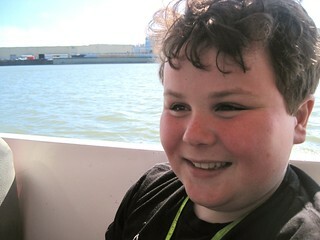 When Leo and his sisters are out of school for the summer, my focus shifts to keeping us busy busy busy -- as I wrote this week both on BlogHer and at Thinking Person's Guide to Autism. 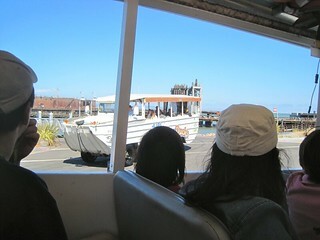 So when we were invited to Ride the Ducks in San Francisco -- take an amphibious tour of the city's streets and bay -- I said Yes Please. 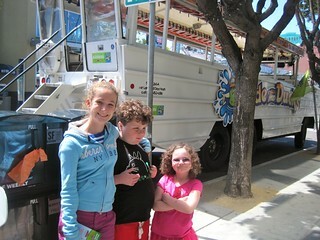 Leo adores riding in buses, trains, boats, and planes, so I suspected he'd love riding in the boat/cars. And I was right. The tour ended up keeping him happy and entertained for nearly two hours (and you're welcome to browse our photoset). The only issue we encountered had nothing to do with the Ducks -- Leo announced he needed to hit the head as soon as we boarded the vehicle, and all the bathrooms in the Fisherman's Wharf vicinity have long long lines -- so we ended up needing to take the next tour instead of the one we'd booked. The Ducks staff were patient, friendly, and helpful and made the transition to the later trip seamless. Whew. Leo and his sisters were all thrilled. We spend a lot of time in San Francisco, but we rarely visit the most touristy places -- which means they don't know those areas of the city. So tours are actually a decent way for kids to learn some history nuggets. 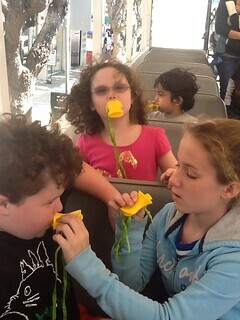 The kids were given "quackers," and were encouraged to quack throughout the tour. Mali had no problem leading the charge. Iz helped Leo figure his quacker out. 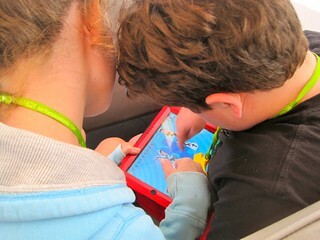 While we waited for the tour to start, Leo and Iz chilled via iPad. Leo is absolutely obsessed with the spelling app WordWall. 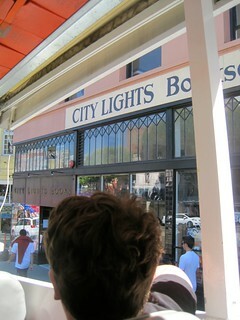 We saw many, many, many landmarks. Like Alcatraz. Which, to my great embarrassment, I have never visited. 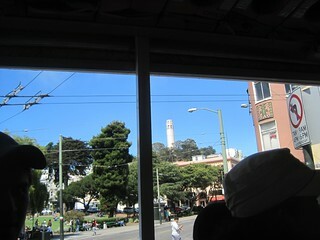 And hey, Coit Tower. We visit it frequently, because we love its murals and the local history they depict. Wish we'd been able to make some stops, alas. City Lights actually has a great kids' book section. 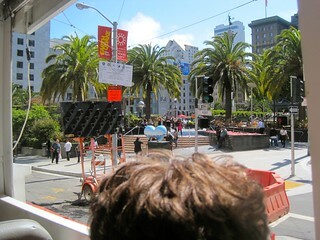 It was a beautiful day to pass through Union Square. 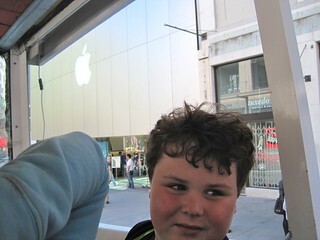 This is the main San Francisco Apple Store, which is always a beehive. I was one of the speakers on an iPad panel there just last month. 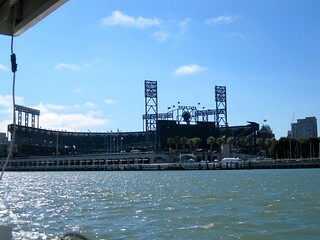 About to go into the water, just south of AT&T Park. Look, there's another Duck! 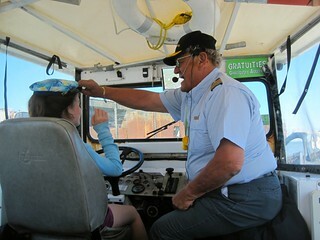 Our captain, who is also named Leo, let Iz drive the Duck once we got in the water. As you might guess by this photo, the sea leg of our trip was Leo's favorite part. 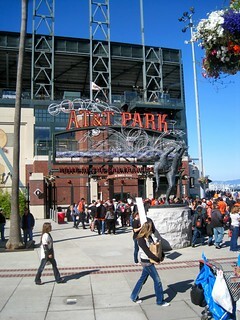 AT&T Park! I hear it's a lovely place to see a game. I've never been. You'd have to hit me over the head with a baseball bat and drag me in by the ankles -- I spent my entire childhood being shunted to my three brothers' baseball games, and never care to see another inning. 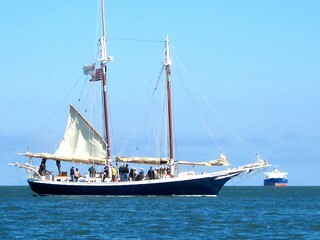 We weren't the only ones at sea. When we got back on land, we drove right by the ball park. I will admit that it is a beautiful ball park. 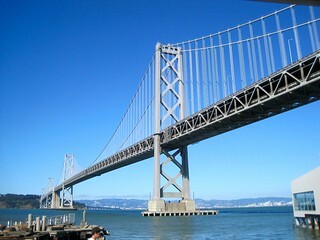 And it really was a beautiful day, as this Bay Bridge shot illustrates. Again, Leo had a wonderful time. 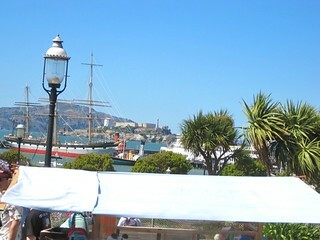 I knew from experience that he would likely sit still through the entire trip, but I also knew that since we were going through the touristy parts of San Francisco, we could exit the vehicle and take a cab or cable car back to Fisherman's Wharf and our vehicle, at any time. I was slightly nervous about the vehicle's open sides, because Leo has jumped out of small boats in the past, but it would have taken a significant effort on his part to escape. I think if your autistic child is the kind of kid who enjoys "transportation days" and has never tried to escape from a moving vehicle, the Ducks tour would be a fun choice. Stephen Shore, Carol Greenburg, Jennifer Myers. TPGA contributors all. At IMFAR 2012. This review is by self-advocate Kerry Magro, whom I finally met in person at IMFAR last month. Thanks Kerry! A community is defined as a group of people living together in one place where they are often intertwined with a common goal or purpose. Now, if you were trying to define an autism community, this book could certainly be one of your best examples of that. Thinking Person’s Guide to Autism, which was edited by Shannon Des Roches Rosa, Jennifer Byde Myers, Liz Ditz, Emily Willingham and Carol Greenburg gives us a look inside autism in today’s society from some of the people who know autism the best. It started off as a blog where they asked people within the autism community to send essays focused around autism related topics. It ended up book published by Deadwood City Publishing. This is no ordinary book. After reading it I was astounded by the amount of information. There is a wide range of topics in essay’s that stay on point with a clear mission and purpose. It is something that any reader who cares about autism can get behind. I had always been an avid reader of the Thinking Person’s Guide to Autsim blog and even wrote a blog post for them about Coming Out About Autism in College in August 2011, so I knew first hand that a collection of these blogs posts could be great. The main areas of the book that stood out to me were done by the editors along with the essays by Laura Shumaker (SF Gate, A Regular Guy with Autism) and Jess (A Diary of a Mom). The book does a great job of balancing between informing the reader and also giving hope and inspiration to them as well. It’s a book that’s very well rounded overall. Along with the essays comes a great deal of resources at the end of the book, which I found impressive. Between recommendations for books, movies, online resources, and blogs, there is a sense of further learning for readers of the book. The next step I see for the autism community now is to continue to encourage young individuals on the autism spectrum to pursue literary work. There were several essays from autistic adults in the book and I’m optimistically hoping that we hear from one or more of these voices on a best-seller list in the near by future. In the end I commend everyone at Thinking Person’s Guide to Autism for all their great work in this project and hope they come out with a sequel very soon to include more of the blog’s wonderful essays. If you want to learn more about The Thinking Person’s Guide to Autism please check out the blog here.